Our Life on a Budget...: Teachable Twos…. 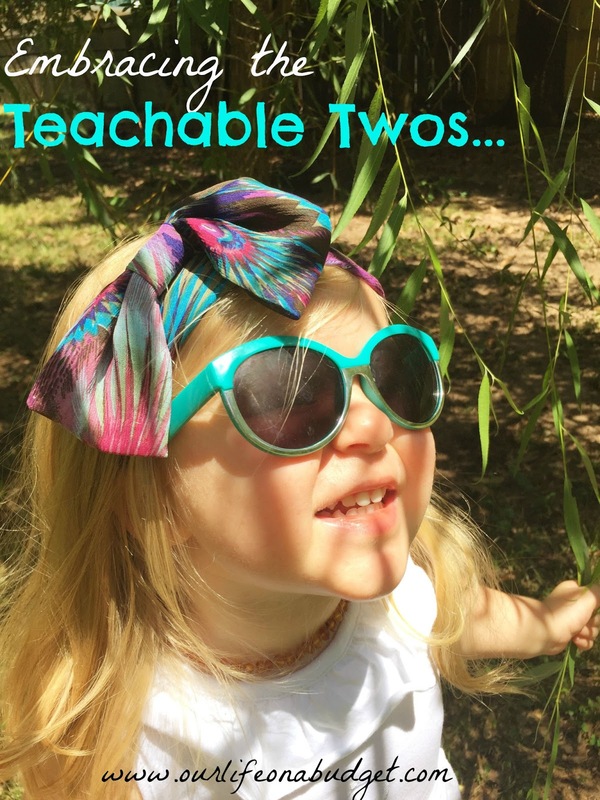 You have heard it, I have heard it… the dreaded "Terrible Twos." As we neared the two year mark with BD, I heard it from everyone. *"Oh, she's almost 2? Just wait…"
Now I should start by saying this. BD is not even 2 1/2 yet, so I don't claim to have all the answers or even have it together. I also want to assure you that this is not about things being easy… because BD is all about getting what she wants and we are learning how to handle that. What it is about is a perspective change. *If there is one thing I have come to know and love about two year olds… they are little sponges. Everyday they know more words, form more complex sentences, run faster and problem solve better than the day before. *If there is a second thing about two year olds that I have learned is that, just like the rest of the human race, they are painfully selfish…. a tragic condition we all inherited in the Garden of Eden, right? *Third thing? They do not have the same emotional capacity that adults do…. aka when things do not go their way, they are still learning how to handle it. We as adults *mostly* know that tantrums don't work and can keep our emotions at least a little in check (though I can admit that I still have my moments). Two year olds have not mastered that skill. So it comes down to a perspective change. When my two year old does something crazy, am I going to view this as a terrible time or a teachable time? Remember they are sponges so the ways we react and the perspective we take matters! So I remind myself each day and in the moments it is hard… to embrace the teachable twos… they are years we will never get back again! What are your experiences or thoughts on raising toddlers? Regarding the other comment -- my MIL loves to say "It's not the terrible twos, it's the tumultuous threes." She says it so often, it's kind of annoying, lol! But still...it does seem to be the case for some! At any rate, Grayson is not yet 2 but I see all these things you are talking about, and it is becoming more and more challenging to keep my patience when he loses it over me cutting the green top off his strawberries or handing him the wrong cup. But I agree with everything you said, and I try to remain positive about it too! :) There are so many other things that are really, really good! It's not as hard to keep your cool if you can train yourself to focus on the good things! Glad to see you are hanging in there with two kids! ;) haha! As the mom of 10, I absolutely agree with the above posters. 2 is doable. It's 3 year olds that make me want to tear my hair out and tantrum right alongside them. What a good word on the terrible twos. Oh. what a stage! I still remember my kids during those years. My son was into everything and pretty destructive. My daughter was more moody and dramatic! But, they do pass quickly. I love your thought here, "So I remind myself each day and in the moments it is hard… to embrace the teachable twos… they are years we will never get back again!" Came over on Friday Favorites. Glad to find your post. I always hated the 'terrible twos' label, as well as the one for threes. And I hate the label for teens. And pre-teens. I believe that when we refer to our children with these labels, we are speaking a lie over them, we are basically setting them up to live up to those names. I never referred to my kids with those names...ever. And my son had these crazy temper tantrums! I wrote a blog post about it and how I handled his tantrums. My oldest is 14 now and things have been going well with her. Sometimes she is a bit moody, but we talk about it and she spends time in prayer. I will not be telling her or others that she is now in the 'rebellious teen' years. Why on earth would I say that about her or any of my kids? Parenting is never easy. Each age and stage brings along it's own challenges. Our choice, as parents, is whether we will speak truth and life over our children...or speak lies and death. Our words have power. Power to build up and power to tear down. Stasia, you are on the right track with your change in perspective. Speak life, sister! The little boy I nanny is 2 and it can be difficult at times but it is so true that they are little sponges and learn so much at this age! Every age group can be stereotyped in some way. You have to rate your experience with each of your children on a case by case basis. Otherwise you almost expect your kid to act a certain way just because they're in a certain age group. That said, MY two year old can be a beast! However, he can also be a clown, a sweetheart, a great helper, and an awesome big brother. He has terrible days, yes, but he's not a Terrible Two.